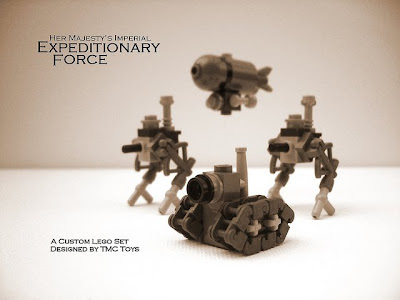 Having had a go at creating some of my own steampunk Lego, I have to say I'm loving these mini vehicles of Her Majesty's Imperial Expeditionary Force. They look like they wouldn't be out of place in the forthcoming Pax Britannia: Anno Frankenstein. What's even better is that you can buy the set here. Hi mate. Just wanted to say thanks for the feature, it is much appreciated - particularly as I'm a big Pax Britannia fan. It genuinely made my day seeing this on here! Very happy to feature anything else you do like this. Just drop me a line at info@JonathanGreenAuthor.com. If you liked these guys, check out www.empireofsteam.blogspot.com for some larger-scale steampunk LEGO. The microscale stuff was a bit of a departure from my usual style of steam-flavoured building. Prompted by our exchange, I picked up Unnatural History last night and started re-reading it. Thoroughly-enjoying it once again. Glad you're still enjoying it the second time around. Have you read any of the other titles? And if you want to produce your own Lego take on the world of Pax Britannia, I'd love to put up a post about it on my blog. Will the PB Lego be returning to the stores? If you'd like to buy some it most certainly could. Which kit were you after? I thought you might like to know that the PB Lego kits are available again through eBay.